Peter: Nazi commandant Helmut Oberling is one sadistic SOB, sending scores of prisoners to an agonizing death and lording over it with guffaws. An American prisoner proves a tough nut to crack but, eventually, Oberling always gets the information he desires and, after hours of torture, the American gives up the address of the resistance headquarters. Oberling rewards the GI with death by gas and then heads off to round up a group of resistance fighters and earn more acclaim from Der Führer. Unfortunately for Oberling, the American has supplied faulty intel and he skulks away, madder than hell. On the way back to his concentration camp, the vehicle he's riding in crashes and he's left in a forest to fend for himself. The spirit of his American victim appears before him and he rushes it, only to discover he's fallen into a deep pit and broken his leg. He calls out for help until his voice is gone and, hours later, his own men wander into the area but Oberling can only listen as the men carry on their conversation. Seems they'd been given orders (in a weirdly American accent) to dump the remainder of the deadly gas into the pit in the forest. "The Elements of Death" is not a bad little story at all, with some creepy Talaoc art. I'm not sure why the Nazis soldiers would note that the voice on the phone "had a strange... accent!" and "sounded almost... almost like that American!" and then follow the orders without double-checking. "The Day After Doomsday" is yet another silly chapter in the ongoing series of vignettes by Len Wein, this one done as a rhyme. The first two sentences are taken verbatim from a Fredric Brown short story ("Knock"). The last man on Earth is sitting in his living room and there's a knock on the door. There's a letter on his doorstep. He opens it and finds his draft notice. That's it. The Red Baron is plagued by nightmares of a skeleton dressed in a bishop's clothing in "Dream of Death." Why the religious dreams? Von Richthofen has no idea until a few weeks later, when he's shot down by a Canadian pilot named... Bishop! In the fourth and final short, G.I. Saunders is a coward and, very soon, a murderer in the jungles of Vietnam. After he kills Pierce, one of his comrades, for rations, Saunders is captured by the enemy and tortured for information but finally released once the war ends. When he makes it home, he discovers everything has changed and he attempts suicide. The spirit of Pierce arrives when the gun clicks on an empty chamber and informs Saunders he was actually killed in action and he's gone... to Hell! Wow! What a surprise. All three of the short-shorts this issue were a waste of paper but the final story, "Homecoming," is embarrassingly bad and deteriorates into incomprehensible gobbledygook. Jack: "The Elements of Death!" 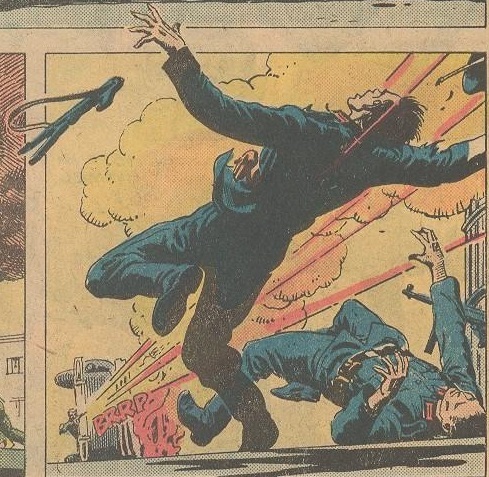 is a decent revenge tale, well-drawn, with a chilling panel on the first page of the Nazi laughing while prisoners are gassed. The two shorts that follow are weak and the last story, "Homecoming," is a real dud, with sub-par art by Frank Redondo. "Hell's Angels! Part II-The Maverick Ace!" Peter: The Unknown Soldier's latest mission is to head into the North African desert and search for Rommel's hidden cache of fuel. US and his men ride into a small village once held by the Italians. Luckily for the Soldier, two of his men are drunks and they can smell wine a mile away. 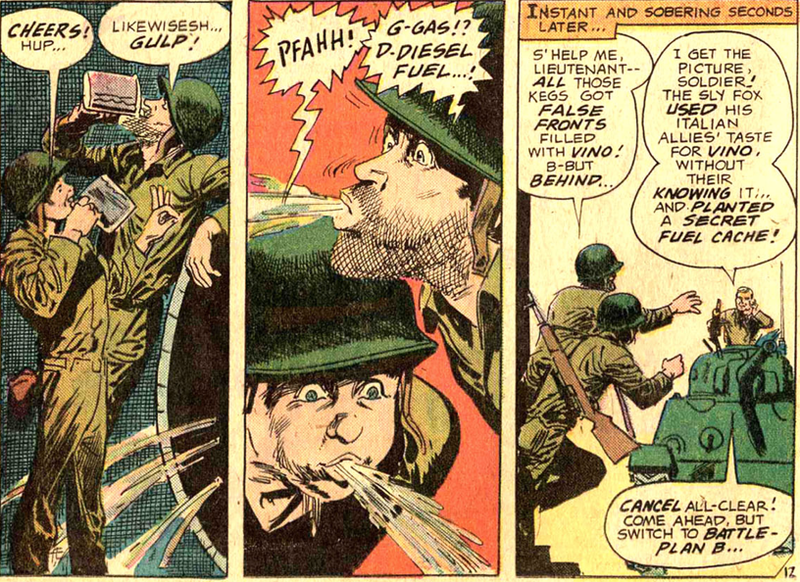 That comes in handy when they discover that Rommel's fuel is being hidden inside huge wine barrels. A successful mission? 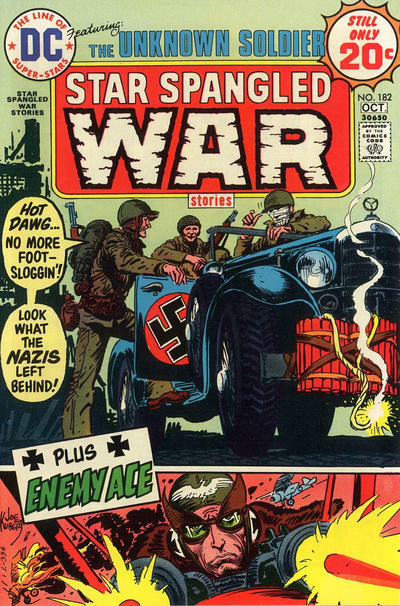 Well, only after US and his men blast the Nazis who are attempting to ambush them. One of the better Robbins/Sparling duets so far, "A Thirst for Death!" is exciting, well-plotted, and contains some crisp dialogue. We don't really know who the Unknown Soldier is posing as until the sixth page, which also creates some nice tension. Of course, this is also the Robbins/Sparling swan song; their shoes will be filled by David Michelinie and Gerry Talaoc. It's also, unfortunately, Archie's final issue as editor. Our loss here will be our gain in the future though when we get to his 1974-75 stint as editor of the Warren comics line. After Steve Savage, Balloon Boy, is captured by the Hammer of Hell himself, he's hauled off to the Enemy Ace's dinner hall and given a nice meal and toast before he's to be taken to a prison camp. 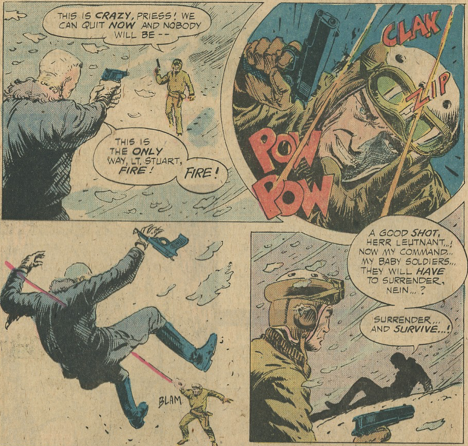 Von Hammer raises his glass and Savage sees his opening, grabbing the Ace's gun and shooting his way out to the base's air field. He commandeers a Fokker and heads for the clouds, where he happily runs across a sky full of German balloons. Suddenly remembering he's the Balloon Buster, Savage makes quick work of the helium sitting ducks and then flies off to Northern France. Steve's Fokker runs out of fuel short of the the field but luckily right at the doorstep of the sweet Madame Celeste. 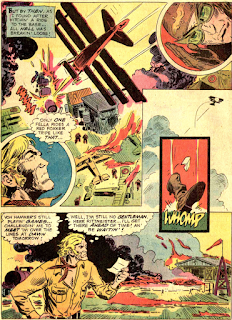 Meanwhile, von Hammer and his squadron have decimated Savage's air field and left a challenge: the Enemy Ace invites the Balloon Boy to a duel in the sky at dawn! Though the story is a fun one, you can't help but feel "Hell's Angels" is bargain basement Enemy Ace compared to the stories of old. There's not much to the plot and Kanigher makes von Hammer into a buffoon (unless it was von Hammer's aim to take Savage out in the air?... more on that in the conclusion next issue) who can be easily outfoxed. 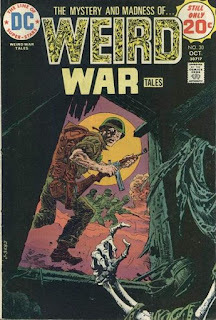 Frank Thorne continues his chores as poor-man's Kubert... but I'm not being critical; a poor-man's Kubert is still nicer to look at than most of the other work being tossed off at the DC War bullpen easels at the time. 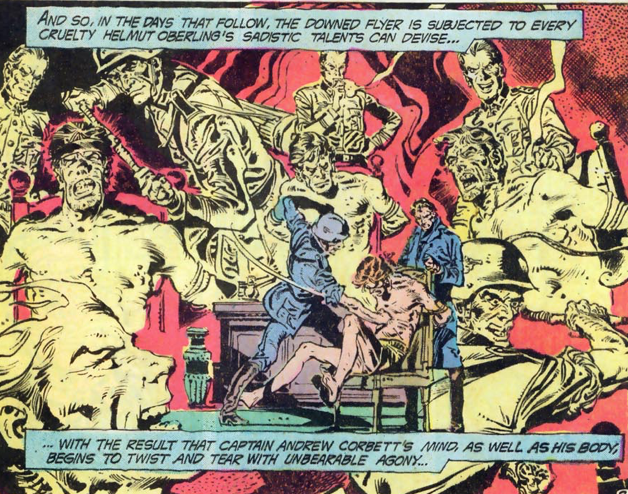 I suspect that, even though there's no credit, Joe must have given a helping hand to Thorne's penciling. It's just too close. Jack: Page two, panel two (above) of the Enemy Ace story really looks like Kubert redrew the closeup of Steve Savage. 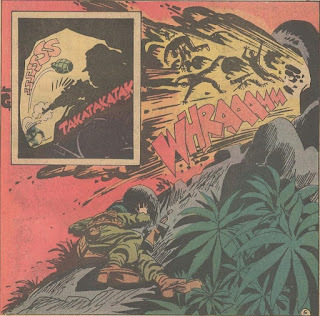 I did not like Kanigher's portrayal of Savage in this story; he seemed like a jerk in comparison to the decent von Hammer, yet I felt like I was supposed to be rooting for Savage. Perhaps it was my mood or the noise in the room, but I couldn't make heads or tails of much of the Unknown Soldier story, which seemed more like a Haunted Tank story for much of its length. I'm thrilled that we'll see the end of the Robbins/Sparling run on this series, since I have not been impressed with either's work. Jack: Nineteen centuries ago, gladiators fought to the death in the Roman Colosseum. In WWII, Sgt. Rock and Easy Co. encounter Nazis dressed as Italian partisans on the road to Rome. A gun battle erupts and Rock is taken prisoner. In a jeep with four Nazi guards, Rock manages to escape and run into the Colosseum. 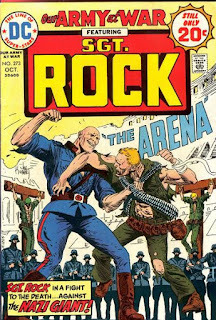 Like the gladiator of old who was forced to fight an octopus in a flooded arena, Rock is doused with water from a high-pressure hose and then made to engage in hand to hand combat with Bruno, a huge, bald, muscled representative of the Third Reich. After the rotten Colosseum floor gives way and both men fall below, Rock emerges unscathed while Bruno lies unconscious. 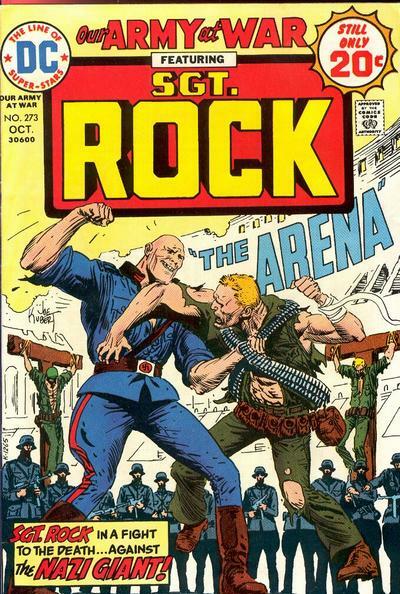 Whereas the ancient gladiator was crucified, Rock makes his way through the passageways underneath "The Arena!" and avoids being killed by gunfire from above. 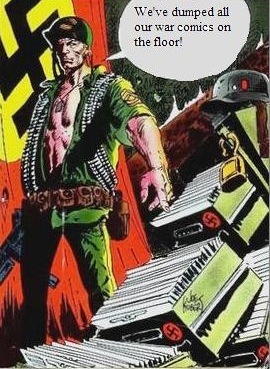 Suddenly, the Nazis are defeated by Rock's comrades in Easy Co. 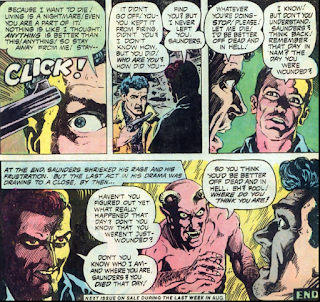 While it's great to have Russ Heath back drawing a Sergeant Rock story, this one suffers a bit from Bob Kanigher's recent tendency toward heavy-handed religious allegory. The comparison between Rock and the ancient gladiator is forced, and the final panel, in which numerous ancient men are seen crucified on flaming crosses, doesn't make a whole lot of sense. Rock and his men are fighting a war and are on even footing with their enemies, while the men who were crucified during the Roman Empire were not evenly matched with their foes. Rock survives but they did not, yet the last caption reads: "Does anything ever change ... between yesterday and today?" I would submit that the events of this story show that it does! Five minutes after being awarded a Silver Star, Davy lies dead. In a flashback, we see that he landed on a beach in the Far East as a WWII Marine and got into battle right away. He was saved from a sniper in a tree and from an enemy soldier's bayonet. He climbed a cliff and threw the grenade that blew up a cave of Japanese fighters. As his medal was being pinned on, a Japanese plane attacked, and Davy shot it down just before he died. "Once a Hero ..." always a hero, it seems, though his death will keep anyone from knowing what he thought of all that happened to him. A pretty good entry in the Gallery of War series, marred only by Estrada's simplistic art, which I don't find pleasant to look at. Peter: We've seen that split-screen "gladiators from another time" stuff so many times, I'm not sure a new spin could be found, but Bob's finale is a little too preachy for my tastes. The Heath art, though, is fantastic, so just avoid the annoying word captions and you'll be okay. Neither the script nor the art for "Once a Hero..." floated my boat. After starting out like a house on fire, Big Bob's Gallery of Irony and Angst has been hit and miss lately. Mostly miss. Peter: In the snow-covered mountains of Italy, the men of the Haunted Tank are coming across the last vestiges of Hitler's once-mighty tank armada. Unbeknownst to our heroes, in a nearby castle, plans are being made for a "death stand," wherein the Nazis will sacrifice their youngest soldiers while the rest of them pull back in an effort to regroup. Of the commanders gathered at the meeting, only General Preiss speaks out against the wholesale slaughter of his troops, many of them mere teenagers. But in the end, Preiss agrees to lead the suicide squad against the allies. Their first order of business is to blow up the castle and block the pass they mean to retreat on. The Haunted Tank rolls up just in time to see the Germans laying explosives and Commander Jeb Stuart knows right away what the play is. When the Jeb's cannons destroy the explosive, General Preiss waves a white flag and suggests an odd form of "cease fire": his tank and the Jeb will square off in a one-on-one battle and if the General dies, his men will peacefully surrender. Preiss's tank is destroyed and, when he fires on Jeb, the General is mortally wounded. As he lays dying, it becomes apparent to Jeb that Preiss sacrificed his life so that his men might survive. "The Final Clash," Archie Goodwin's final Haunted Tank story, is nothing special but still manages to entertain. This plot is pretty well worn down (but then so are the other three or four that keep getting recycled), but Archie's portrayal of Preiss as a stern, but kind, soldier rather than a baby-eating monster is refreshing. 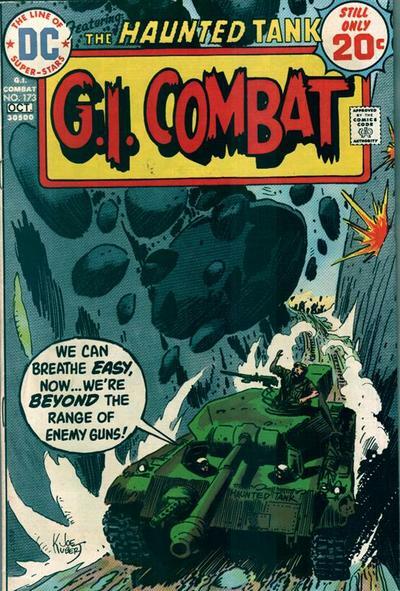 As with the Rock stories, I get the feeling the Tank saga is jumping from era to era, with this one clearly nearing the end of the war. In October 1944, a "Special Attack!" is launched on three aircraft carriers by a squadron of Japanese pilots, all willing to commit suicide for their country. The attack takes the carriers by surprise and only three jets can be launched. The numbers outweigh the American fighter pilots but they manage to make a dent in the Zero population. 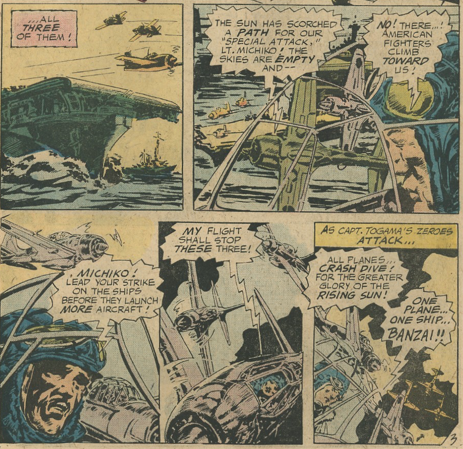 When the fight is left to one Japanese and one American, both badly wounded, our man takes a page from the book of the Banzai and sacrifices himself for the good of the ships below. I was really impressed with "Special Attack!" It's got a decent script, lots of action, and some dynamite graphics from old-timer Sid Check. I'd have never identified this art as that of a Golden Age vet. It's got a very contemporary look to it, as if Toth and Niño lent helping hands. Jack: I agree that "Special Attack!" was better than "The Final Clash," but I thought the art (and the plot, for that matter) were a bit muddled. 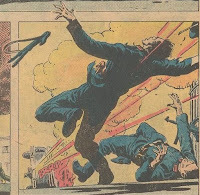 As I read the second story and tried to keep up with what was going on, I realized why George Evans was so accomplished with stories involving airplanes--his panels are crisp and clear and it's easy to follow the events. 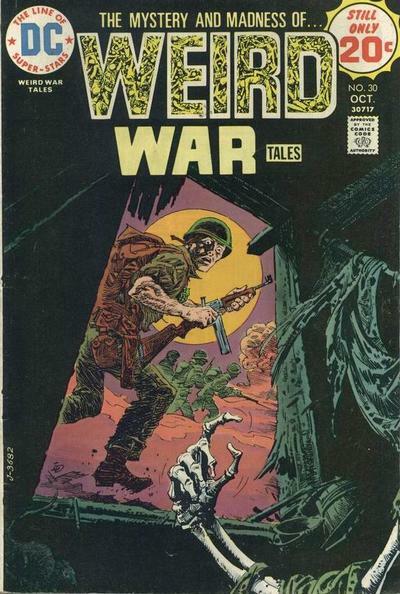 The Haunted Tank story seems to be Archie Goodwin's swan song, and it's about as good as much of the rest of his work for the DC War comics: pretty good but not great. I think that, if Goodwin had not excelled elsewhere, we wouldn't have paid much attention to his DC War stories.